Here are my Pics from Rocktoberfest I rode with the Yellow Blazer on 49" Iroks rockwells and rearstear cool rig. And we followed the FJ around super cool rig. Let me know what you think! That is a freakin sweet pic! 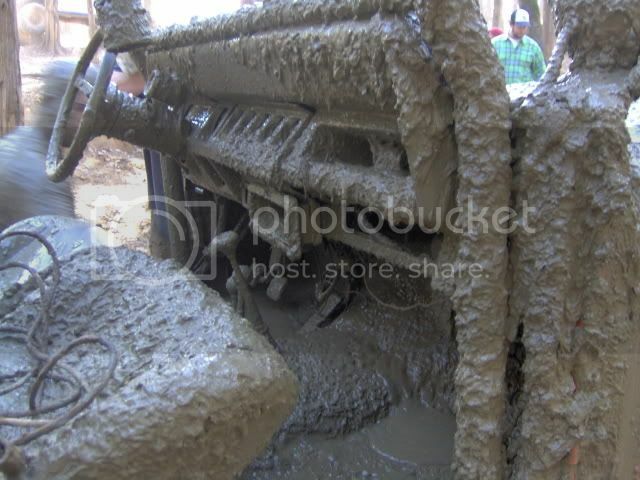 The mud in the jeep came from the trenches they have down there they are crazy deep and some stupid guy tried to go through the deepest hole with no top on it was funny to watch. Yeah this is the guy I rode with super nice guy and needless to say I had a blast. by no means am i knockin his rig, just seams like all the fun of wheeling is lodt when your rig is that big. i know i couldnt do what hes doin but what is there he cant do you know!? That is true what you said...but it is a pretty sweet picture though. I know it's hard to believe but the trail he is on right there is called PURE HELL and it's crazy he laid it on it's side twice but just kept on driving and it ploped back over both times. There aren't many places he has to winch but there are some places out at Cass that he has some trouble with. He actually broke two window's on PURE HELL that day. i wouldnt replace them...he trailers it anyhow im sure....? nice pics. I would just kill myself if I was that guy with the muddy jeep. lol. Had to be fun to watch though. wow at wide axles, dana 70 and dana 80 maybe? ???? I'm not sure what rig your refering to? they have axle breaks i believe??? That blazer is propper!!!! The blazer is running 2 1/2 ton rockwell axels. Off of a large military truck. Help Me Identify My Head that needs replacing!